It's being held in New York — enough said. Why not give yourself an excuse to visit the Big Apple? Get one-on-one time with the world’s leading experts in language learning. Combined, Richard, Alex, and Olly speak over 50 languages. Alex Rawlings was even named, Britain’s most multilingual student. Their workshops are designed with you in mind: breaks and Q&A sessions give you the chance to ask them your burning questions about language learning. You’re sure to learn plenty of great tips from these language masters. Share a cup of tea or coffee with an expert! Be part of a multicultural meetup. Meet people from all over New York, the country, and maybe even the world. We’ll even be there and we’re from Detroit, Michigan. . . I mean, it’s not as far from NYC as Europe, but we still have to take a plane to get there! Let us know where you’ll be coming from in the comments. Get the first scoop on Mango’s newest innovations. Mango will be presenting about one of its newest products. We want to know how we can make a reading app that could directly benefit you. We’ll be demo-ing and asking for your feedback in order to create a great product. Become an early adopter and help us create a revolutionary reading app. The power is in your hands. The skills you gain from this workshop will benefit you in various aspects of life, not just language learning. Some of the topics include “How to learn languages efficiently even with a busy schedule.” Replace “learn languages” with anything you would like to be able to do efficiently with a busy schedule and “Voila!” you have skills that can help you in any area of life. Check out the other topics and the full schedule here. It will be held at a language school. Fluent City is a modern language school that teaches awesome after work foreign language classes for adults. 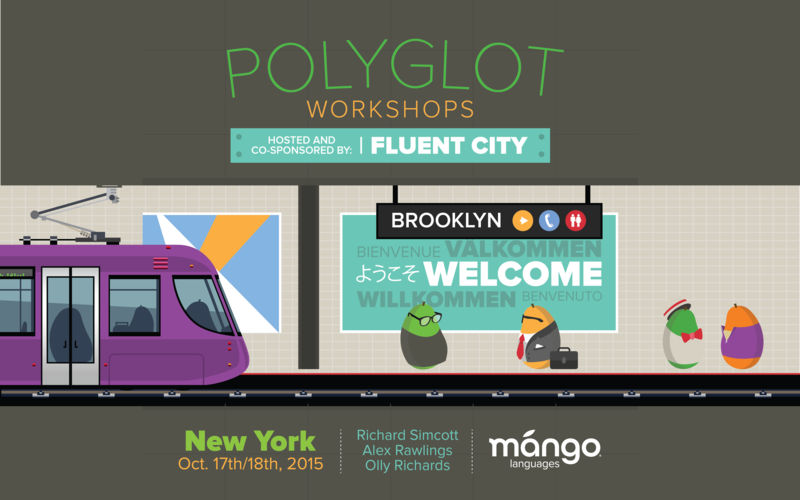 The workshop will be held at their Brooklyn location. Not only will you metaphorically be surrounded by language, but physically as well. Plus, we’ll have lunch on the roof! All three of the polyglots involved are from the U.K.
You’ll hear British English (and other languages, of course) spoken all day. I mean, who doesn’t like British accents? You’ll also find out if learning foreign languages can benefit native English speakers (hint: they do). Have the British accents convinced you? Are you thrilled to give yourself an excuse to visit NYC? Let us know in the comments! Hope to see you there on the 17th or 18th of October!